PyrateJohn - the meanderings of a rogue Pirate looking past 40: Sometimes it's just better to be lucky than good. Sometimes it's just better to be lucky than good. 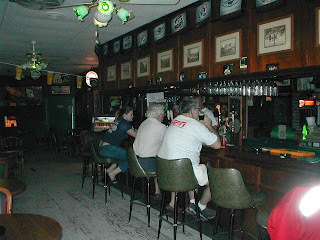 The bar is the Tir na Nog in Daytona Beach. Read a bit down for the tale. Can we say "free beer?" Or as those signs in Mexico supposedly often say, "Free beer tomorrow." Those signs stay up for years and no one has ever seen that free beer. In a previous post I wrote that our motorhome's LP gas heat wasn't working. Not a major deal here in Florida since we could run the electric heat when staying at an RV park, but that an alternative source of heat would be nice and was an improvement project that I was looking into. On Saturday Deb was cleaning the bedroom and commented to me that she had accidentally turned something on. Something was making noise and the bedroom was getting hot. Zounds! The rearmost gas heater was running, and running full bore! Now, you have to understand that the ol' Wanderlodge has switches, valves, and thermostats scattered in every nook and cranny that you can imagine. And that the owner's manual is more of a suggestion than a Bible - our Bluebird was one of the first rear-engined buses built, and the manual is typewritten (for you youngsters a typewriter was something that came along sometime after stone tablets and just before the word processor). In addition, the previous owners had the bedroom remodeled by a dealer and it doesn't quite conform to what the factory had in mind. Through sheer good luck we now have all of the safety switches and valves set properly, and have figured out which thermostats operate which gas heaters, and as I write this all three LP gas heaters are capable of doing their thing. Just in time for Spring in Florida and the beginning of our 9 month hot season, right? Speaking of Deb and gambling (my life seems to be a gamble every time that I wake up, but I digress) she was able to relieve the Hollywood Casino in Bay St. Louis, Mississippi of enough green the last time that we were there that it paid our diesel fuel bill for the trip (500 miles each way and 5 miles per gallon, so you do the math). Consequently, the casino keeps inviting us to return, presumably because they want a shot at getting their money back. They offered to comp us a room for a couple of nights. So Deb held out for a room plus a pull-through space for the bus and trailer for a couple of days. This weekend they sent her an email and agreed. So we are thinking about taking a weeklong trip to Mississippi and New Orleans for sometime mid March or late in March. That will coincide with the completion of Jimmy Buffett's latest Margaritaville at Panama City. And any time we get into that area we have to hit some of our other favorites places. 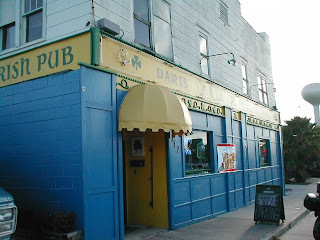 Jimmy's sister's place, Lulu's, and one of our favorite dive bars, Drifters over in Mobile. On a historical note, I am also curious to see if we can find where the remains of Jimmy's grandfather's commercial sailing schooner have been recently found. It should be basically down the road from Drifter's. So if anyone is in the area and wants to get together for a few drinks and some laughs in the tip of the Florida Panhandle, LA (Lower Alabama), Biloxi (gotta stop in and see the construction of Jimmy's new casino and Margaritaville), Bay St. Louis or New Orleans sometime in March then let me know. Speaking of getting together for drinks, last week some of us were shooting the breeze at Buffettworld (http://www.buffettworld.com/) and the political conversation got a bit heated. Well, I told one of the guys that if he was around I'd buy him a beer. Turned out that he was going to be in Daytona Beach but, alas, I couldn't get there on his schedule. The solution? I told him to print out the thread and head over to the Tir na Nog Irish Pub (http://www.tirnanogpub.com/) and to put one or two on PirateJohn's tab. They did. And they got their beer. But seriously, if you are in Daytona and want to get away from the crowds and Budweiser of Bike Week or the NASCAR events for a laid back Irish pub with good beer that gets REALLY fun and funky after about 10PM, then drop by the Tir na Nog. It over on Speedway, near the beach, and only a few blocks (but a universe away culturally) from Main Street. Just be aware that they usually don't open until 5PM. At any rate, my level of generiosity has been reached, at least for the moment. So don't 40 of y'all run down to the Tir na Nog and try to put a beer or two on my account. I was researching some 70's and 80's funk bands and ran across something that both fascinated and horrified me. Remember a band called the Gap Band? They did some great tunes like "You Dropped A Bomb on Me," and "Party Train" that were hits in the early 80's. The band is doing fine as far as I know. But the story behind their name amazed me. Guess that I don't get out much because I had never heard the tale. The band was originally called the Greenwood, Archer, and Pine Street Band until that name was shorted to Gap. Greenwood, Archer, and Pine Streets were, in the early 1900's, called the Black Wall Street. It was a thriving business district in oil-rich Tulsa, Oklahoma until a riot in 1921 left the area a smouldering ruin. Officially 39 deaths occurred, of which 10 were white folks. Unoffically the community contends that more like 300 black folks lost their lives and were secretly buried in mass graves, which would make this the worst race riot in US history. I had never heard of this episode and am frankly amazed that it's not more widely taught in our schools. This may have occurred roughly 90 years ago but if I were a black member of the Tulsa community (which the members of the Gap Band were) I sure as hell wouldn't want anyone to forget this one either. A very sad chapter in the history of this nation. As I was writing this post I got word that another one of my favorite barkeeps had passed on. Cactus Jack, the unofficial Mayor of Salt Springs, Florida has left the room. Jack was a nice guy, and quite willing to pose for some photos when I wrote my book on Northeastern Florida a few years back. He was like many of us; he had done the corporate gig for many years and decided to retire. The wonderfully restored old Ford in the photo was his, incidentally, and Jack and his Ford fit in well on the outskirts of Salt Springs, which is a sleepy little rural crossroads on the edge of the Ocala National Forest. And as they like to point out in these parts, Jack was always good to bikers and other wanderers who happened to stumble in.